Philip Melanchthon, Martin Luther, Johannes Bugenhagen, and Caspar Cruciger work on the translation of the Bible into German. (19th century illustration after the 1846 painting by Pierre-Antoine Labouchère). For centuries the Church had been using the Vetue Latina (“Old Latin”) translations of the Bible. By the time of the 13th century they were eventually eclipsed by St. Jerome’s fourth-century Vulgate, though that version would not be declared the Roman Catholic Church’s official Latin Bible until the Council of Trent (1545–63 AD). Only an elite educated minority—mostly clerics—was at ease in Latin, meaning that access to Scripture reading was largely limited to that exclusive group. One such member was Martin Luther, an Augustinian monk was appointed to serve as Professor of the Holy Scriptures at the University of Wittenberg. He established the Reformation principle sola gratia and sola fide while studying St. Paul’s epistles: man’s salvation comes by God’s “grace alone” and this “through faith alone,” and not in any way dependent on his works. These teachings, drawn from the Scripture, would be the basis of his disagreement with Roman doctrine. Luther and the other Reformers considered sola scriptura (“Scripture alone”) to be the foundation of the Reform Movement. The Bible as an authority was not itself new to the Reformers; the novelty lay in the fact that it was the Bible alone which was to be the norm for Christian teaching, rather than Church Law. Martin Luther believed that the Bible was the one true source of our knowledge of God’s will and that no authority, papal or otherwise, was entitled to stand between the Word of God and the individual Christian; nor, he would argue, should any linguistic barrier hinder access to God’s Word for any Christian. The importance of the universal availability of, and general accessibility to, the Word were unrelenting forces powering Luther in thought, word and deed: God speaking salvation to man through the proclamation of the Word, first through the biblical text itself, but also through Scripture-based writings, sermons, and hymns. It would be inaccurate to state that Bible translations were non-existent in Roman Catholic territories prior to Luther. In fact, German-speaking Europe had a particularly strong tradition of biblical translation, a tradition strengthened immeasurably but not founded through the reforming work of Martin Luther. In fact, between 1466 and 1522, seventeen different printed editions of the German Bibles were printed. All these pre-Lutheran Bibles share two characteristics: they were translated not from the original Hebrew and Greek texts but instead from the Latin Vulgate, and they were written in a stilted, sometimes incomprehensible German, far removed from the language used by ordinary people. Luther redressed the situation, laying down two fundamental requirements for an adequate German Bible: it should be based on the original Hebrew and Greek texts, he said, and it should be written in a German that was understandable to all. And so, while sequestered in the Wartburg Castle (1521–22), Luther began to translate, using as his guide the humanist scholar Desiderius Erasmus’ second edition (1519) of the Greek New Testament, known as the Textus Receptus. To help him in translating into contemporary German, Luther would make forays into nearby towns and markets to listen to people speaking. He wanted to ensure their comprehension by accurately translating into a language to which every German-speaking Christian could relate. In his Open Letter on Translating (1530), Luther explained that “In translation you cannot speak German with a Greek or Hebrew tongue.” In other words, Luther wanted Moses to sound like a German. Luther’s New Testament was published in September 1522. In a new and refreshing way the Word of God sprang from the pages of the Bible into the heart, minds, souls, and tongues of the common folk. It became the people’s book. And so, while the Luther Bible was not the first German translation of Scripture, it was certainly the most influential. By 1534, Luther had completed his landmark translation of the Old and New Testaments from Hebrew and Greek into German—one of the most significant acts of the Reformation. 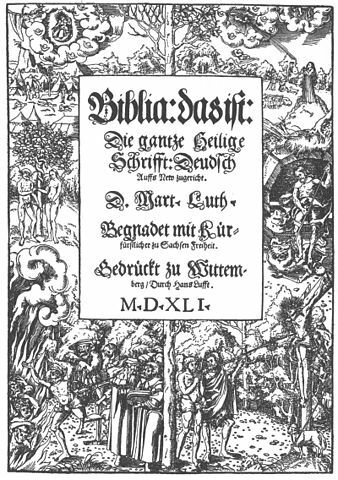 Ezekiel prophesies in the valley of the dry bones saying, “O dry bones, hear the word of the Lord!” (Woodcut by Lucas Cranach the Elder in 1534 edition of Luther’s Bible, handpainted). Thanks to the relatively-recent invention of the printing press, Luther’s Bible was soon present in virtually every German-speaking Protestant’s home, leading to great growth among the biblical knowledge of the German masses. Luther even had large-print Bibles made for those who had failing eyesight! In translating the Scripture’s, Luther reformed not only religion but also the German language. The pervasiveness of his German Bible helped to create and spread the modern German language as well as an emerging national identity. This vernacular Bible empowered and liberated all who had access to it. The existence of the translation was a pervasive public affirmation of the reality of the possibility of reform, removing any elite or priestly class from exclusive control over words—even the Word of God. Having God speak to all individuals in their homes—in the way they themselves spoke—elevated the common person’s sense of self-worth and led to a new democratic vision. Luther’s goal of a readable, accurate translation drove the move towards universal education, since he taught that everyone should be able to read in order to understand the Bible. Luther further believed that mankind had fallen from grace and was ruled by selfishness, but had not lost moral consciousness: all were sinners and needed to be educated in biblical teaching not only for salvation, therefore, but also to establish a common basis for law, order, and morality. The front page of the 1541 edition of Luther’s translation of the Bible. The Luther Bible would also prove influential in the spread of the Reformation internationally. Luther’s translation influenced English translations by the reformers William Tyndale and Myles Coverdale. Their translations would in turn inspire other translations, including the classic 1611 King James Version. Luther’s translation also inspired the translation of the Bible into other languages—the languages of Eastern and Northern Europe, first of all, and eventually throughout the World into thousands of languages. And this in turn elevated literary culture as a whole. Bibles in these newly elevated languages required dictionaries; now-common congregational singing spawned poetry for countless hymns; the need for instruction and edification for the growing literate population caused the flourishing of catechisms and devotional materials, often paving the way for a flurry of secular national literature and an accompanying sense of national pride and unity. This pattern has continued down throughout the centuries. It is small surprise to learn, as a result, one of the first written documents in a North American First Nation language and the first in any Namibian language was Luther’s Small Catechism. “In the beginning was the Word.” And that Word transformed the World. Rev. Dr. David Somers is pastor of Église Luthérienne de l’Ascension in Montreal, Quebec.